This will be our 9th year now paying tribute to the amazing and oracular Anthology of American Folk Music, the Rosetta Stone of pre-war American Roots Music, and raising money for The Penns Valley Hope Fund, a local grassroots organization providing emergency assistance to local people facing sudden and unexpected need. The dates are Saturday Nov. 12, and Sunday Nov. 13, 2016 at Elk Creek Cafe + Aleworks in Millheim, PA. 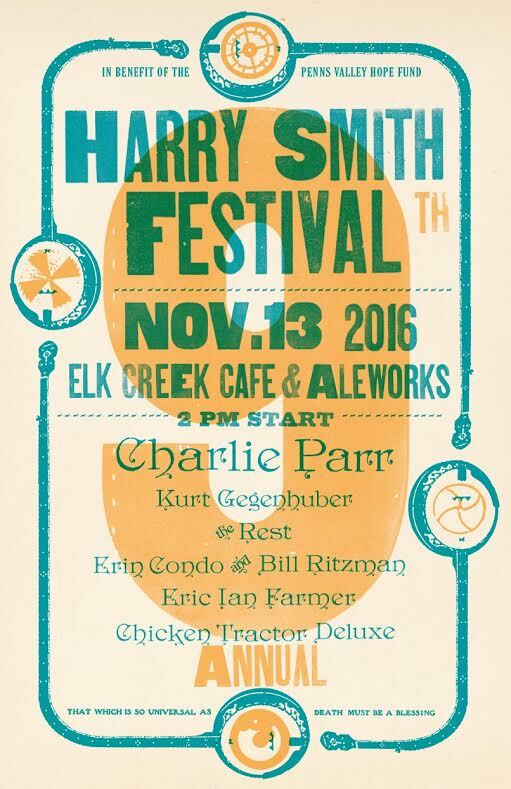 This year we are very excited to have confirmed Charlie Parr playing 8 PM Saturday evening at the Elk Creek Café on Nov. 12th and then joining us again the next day for the Harry Smith Festival. Charlie Parr is a fantastic country and blues player out of Minnesota. An amazing performer, playing guitar, resonator guitar and banjo, he draws from Charlie Patton, Bukka White, Reverend Gary Davis and others. No Depression says of his recent album, Stumpjumper, “Taking acoustic blues and folk to the darkest edges of town via driving arrangements which emphasize steam-driven tempos and a doom- slinging attitude over spit and polish studio shine, Parr nonetheless manages to sound both breathtakingly immediate and authentically antiquated at the same time.” Check him out here: http://www.charlieparr.com , and here: http://www.npr.org/event/music/433088678/folk-alley-presents-charlie-parr. Sunday is the Harry Smith Festival, proper and functions as a benefit for the Penns Valley Hope Fund, a very worthy local grassroots organization providing emergency assistance to local people facing sudden and unexpected need. This year’s festival lineup is, as in the past, a great one, with acts from both far and near, performing short sets of songs from the Harry Smith Anthology of American Folk Music involves five performers/bands, including Charlie Parr and host band Chicken Tractor Deluxe. Festival starts at 2.